Emergency First Aid at Work is the first choice of first aid course for most employers, where workers operate in a ‘Low Hazard’ environment. This can include the retail sector, office workers, and all sorts of businesses and organisations where there is not a high risk of injury to the workforce or anyone visiting the organisation. 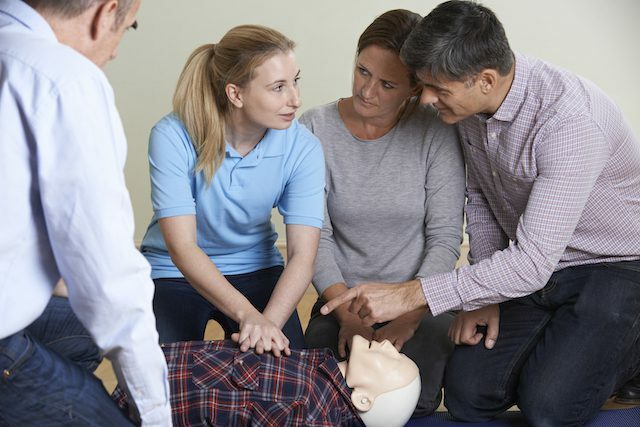 This 6-hour course covers basic first aid techniques and skills, and the roles and responsibilities of the Appointed Person in the workplace. It is usually delivered over a single day. Scroll down to register individuals on one of our public courses from the calendar below. Or, contact us to enquire about running a private course for your organisation, delivered at a time and location to suit you. Why Choose the First Aid Training Co-operative? Our ISO9001 registration, robust Quality Assurance procedure, a large team of highly experienced trainers based across the country, and many years of experience across multiple sectors make us the best choice for your first aid training requirements.